The Seasonal Sharing ministry was formed more than 25 years ago and today is widely supported by the people of St. Mary’s. Its focus is to coordinate St. Mary's efforts to help provide families in the Manchester community with food and necessities during the Thanksgiving and Christmas seasons. Names of local families are given to us by the Family Resource Center at Bennet Academy, Manchester Area Conference of Churches (MACC), and by other community groups that are aware of families in need.Our baskets have been called “designer,” since we tailor the contents to exactly what the family needs down to dietary restrictions and household appliance availability. For Thanksgiving, St. Mary’s supplies food insecure Manchester families with a complete holiday meal, non-perishable food items and milk, cheese, butter, eggs and bread. We typically provide for close to 30 families at Thanksgiving. 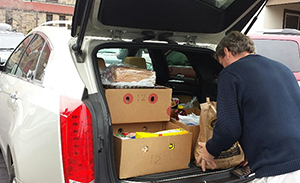 The donations of non-perishable food items by St. Mary's parishioners, along with their generous monetary gifts make this all possible. At Christmas, our church family will once again provide both non-perishable and perishable food items, plus a gift for every family member.This typically means gifts for over 120 people. Coordination of Efforts – The Seasonal Sharing organizing committee includes very dedicated church members who painstakingly coordinate all the details. But this important ministry could never be successful without the help of every church member. The members of St. Mary's Church all put their faith into action by donating canned goods and produce, sorting and packing the baskets and delivering the baskets to the families. Sunday, Nov. 13—Produce Sunday: Bring donations of fresh fruits/vegetables. Saturday, Nov. 19—Packing day: Packing of food boxes begins at 8:30 a.m. in Neill Hall. Sunday, Nov. 20—Delivery Sunday: Come to Neill Hall after the 10 a.m. service to pick up boxes for delivery. Saturday, Dec. 17 – Packing day: Packing of food boxes begins at 8:30 a.m. in Neill Hall. Sunday, Dec. 18 – Delivery Sunday: Come to Neill Hall after the 10 a.m. service to pick up boxes for delivery. This group was created by parishioner Nancy Eaton for the purpose of making quilts for those suffering from illness, affliction or injury. We are God's children helping other children of God, by using the gifts we have been given and wrapping them in love and prayers. The group meets monthly and is organized in such a way that anyone can join, even if you don't know how to quilt. There are scheduled quilting events that happen twice a year and are held on a Saturday (usually in January and June) from 9 a.m. to 3 p.m. They always have a theme, and anyone can attend. All you need to bring is a lunch. Beverages, dessert and fun are provided! Peace by Piece Quilters has given away dozens of quilts. This includes quilts for children and adults with terminal illnesses, or who are going through treatments for cancer. Quilts have also been given as a contribution to "Quilts of Valor" (http://www.qovf.org) to provide comfort to wounded soldiers who are recuperating in U.S. hospitals. The group has also made bright and fun pillowcases for children receiving chemotherapy treatments (which they get to keep after their treatments), created "cool ties/HUGS" for the troops in Iraq, and sent Christmas stockings to troops in Iraq and Afghanistan. As quilts/items are completed, they are displayed and blessed during Sundays services. If you are interested in attending any meeting, we welcome you! If you'd like to help this cause, please contact Nancy Eaton (860-649-0507). This group is funded by donations, which help to cover the cost of postage, batting, thread and fabric. This group creates hand-knit, crocheted, hand-sewn and crafted items to be donated to the local community organizations, as well as our annual May Fair and Christmas in New England Fair. 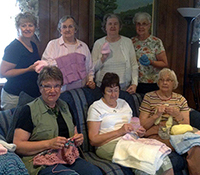 They knit baby afghans and infant hats for the Manchester Memorial Hospital Birthing Center. They also knit scarves and hats for the Seamen's Church Institute Christmas at Sea program. The group meets year-round on Thursday mornings from 9:30am to 11:30 a.m. If this is something that interests you, please stop by the Guild Room on Thursday. For additional information or questions, contact Donna Indomenico (860) 644-0061 or Lyn Jones (860) 206-9460. St Mary’s has taken on the challenge of ‘walling out hunger’ for the past six years. The parishes’ response to this Lenten Challenge has growth significantly over time. Initially, we built a small ‘wall’ on the floor of the baptistery and as the years progressed and interest grew we built a cube system to display the donations and highlight which items were lacking. We really try to focus on specific needs of the MACC food pantry and also push donations of paper products, toiletries and personal care products. So donations wil​l range from cer​eal to diapers, pasta sauce to shampoo, mayonnaise to feminine hygiene products. In 2016 the wall grew to be over 6 feet tall and it took 6 vehicles to deliver to MACC! St. Mary’s mission statement is “God cooks; We share the feast.” As a church we try to make an impact in the local community and world at large in the areas of hunger and extreme poverty. This specific Lenten Challenge gives us a visible way to live out our mission statement and refocuses ourselves as a Christians during the most holy season of the church. ​For the past 3 years St. Mary’s has designated their school supplies drive to benefit Manchester Public Schools’ Family Resource Centers. The partnership allows for us to have a direct impact on the Manchester community. Our first year 30 bags were filled and with each following year a new goal has been set and reached. The 2016 School Supplies Drive turned out to be an overwhelming success with over 90 bags collected and filled, exceeding the goal of 65.